/ Modified sep 9, 2014 8:42 a.m. 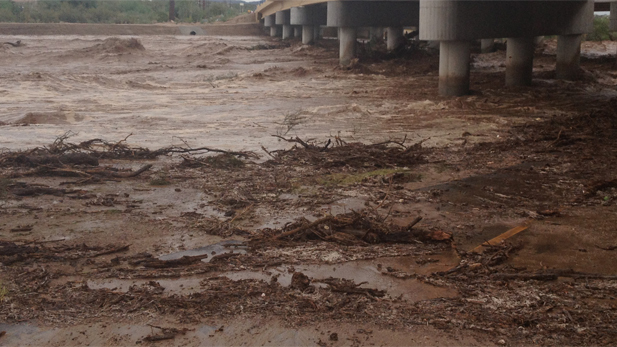 Flooding underneath La Cholla bridge at the Cañada Del Oro Wash in Tucson. Heavy flooding from record-breaking rainfall in Southern Arizona left two women dead in swollen washes, authorities reported. The storm, a remnant of Hurricane Norbert in the Pacific Ocean, led to temporary closure of parts of major freeways in west Phoenix. The Pinal County Sheriff's Office reported Monday the drowning of a 76-year-old woman who was trying to drive across a wash near Oracle Junction, north of Tucson. The department received a call from the woman's husband, reporting their vehicle was trapped. The woman was swept away by the current, while her husband made it out. Earlier Monday, a woman's car was swept away on the east side of Tucson. Tucson Fire Department spokesman Barrett Baker said rescue units went to the Alamo Wash near 22nd Street and Kolb Road around 9:30 a.m. When they arrived, they found a car submerged in 10 feet of water and unreachable, Baker said. Heavy rain also hit the Phoenix area Monday, flooding major freeways and triggering many water rescues. Phoenix Mayor Greg Stanton declared a state of emergency in the city. The National Weather Service reported more than 3 inches of rain fell in Phoenix, breaking the old one-day record of 2.91 inches set in 1933. Sections of Interstates 10 and 17 in west Phoenix were closed, as several dozens of cars and SUVs were towed from the flooded freeway. This evening at 5:30 p.m., eastbound and westbound I-10 in Phoenix were reopened. State Department of Public Safety officials said sweepers had to clear off mud and muck after the cars were removed. Throughout the Tucson area, several roads were closed due to dangerous flooding, including Overton Road at the Canada Del Oro Wash, Limberlost at the Agua Caliente Wash, Wentworth Road at Tanque Verde Creek, Avra Valley Road at the Brawley Wash, Tanque Verde Road at Conestoga Avenue, and Silverbell Road between Avra Valley Road to Sasco Road. County officials warned people to proceed with caution in other roads around town, including Sahuarita Road between Houghton Road and Wentworth Road, Old Spanish Trail at the Rincon Creek, and Valencia Road between Camino Verde to Viviana Avenue. 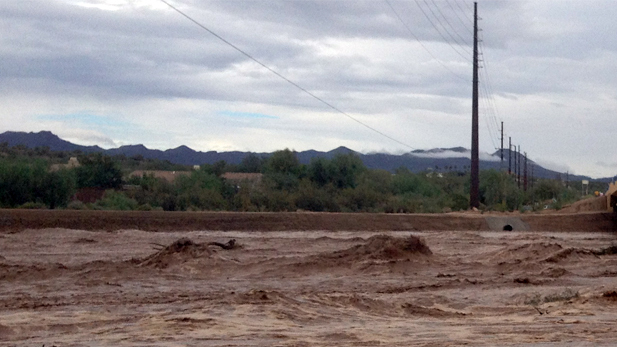 Flooding at La Cholla bridge in Tucson. Numerous school systems and colleges, including the University of Arizona's College of Medicine Phoenix campus, all of Maricopa County Community College District and Pima Community College, either closed schools, delayed openings or canceled afternoon and evening classes. Pima County said in a media release it would dismiss county employees on a staggered schedule starting at 3:15 p.m. Monday. Employees were divided in groups, releasing those who lived the furthest from work first. County libraries in Tucson also announced they would all be closing at 5 p.m.
Gov. Jan Brewer declared a statewide emergency. A media release from her office said the heavy rains caused forced evacuations in La Paz County, and required emergency response search and rescue missions, including the American Red Cross opening shelters in Maricopa and La Paz counties. Both those counties also declared a state of emergency. Brewer directed that $200,000 from the general fund be made available to the Arizona Division of Emergency Management, the release said. Last week, Brewer requested the U.S. Small Business Administration to assist residents and businesses in Maricopa County as they recover from last month's flash floods in the towns of New River and Laveen. The county received rainfall on seven of eight consecutive days between Aug. 12 and 19. List of road closures due to flooding from the Pima County Sheriff's Department.